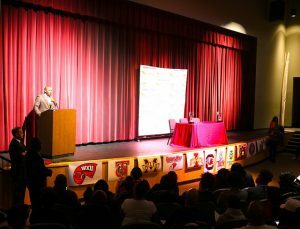 DeKalb County School District (DCSD) celebrates National Signing Day. It starts with a dream. It ends with a gathering of loved ones, friends, peers and mentors cheering your name, dancing to music, and celebrating a shared vision for the future. Close to 90 DeKalb County School District (DCSD) football players committed their futures to college programs on Feb. 7 as part of National Signing Day 2018. Throughout the district, school communities came together to wish outgoing players well as they announced which colleges and universities they will be attending. Schools included Auburn University, the University of South Carolina, the University of Tennessee, the University of Georgia, Emory University, Avila University and more. Approximately 30 of these signings came from Tucker High School and Stephenson High School, which are two of the most successful programs at DCSD. Stephenson football coach Ron Gartrell, who has been the school’s only coach since its opening in 1996, has helped more than 200 athletes pursue athletics at the college level. According to DCSD Athletic Director Mark Brock, under Gartrell’s guidance, Stephenson is second in the state with former players on college football rosters. Gartrell said Stephenson’s football climate is “as good as you can be.” He said he hopes this year’s graduating class continue to succeed and keep their accomplishments in perspective. Jalil Irvin, a Stephenson offensive lineman who signed with Auburn University, said his time at Stephenson was key in developing him as a football player as well as a person. He said the coaches instilled in him a sense of how to be accountable for himself and stay focused on his future. Irvin said he had offers from such colleges as University of Georgia, the University of Oregon, University of Tennessee and the University of Michigan. Irvin said he signed with Auburn because the Alabama-based college because it felt like home. Tucker High School is not far behind Stephenson in terms of leaving a legacy. Tucker is currently ninth in the state for producing quality college football players, including two in the Ivy League in the past 15 years. The school had 17 signees on Feb. 7 alone—the most in DCSD for the 2017-2018 school year. Head coach and athletics director Bryan Lamar said he hopes the signees keep their minds on the future and remain humble. According to Lamar, only six percent of high school football players obtain a college scholarship with an opportunity to continue playing. Lamar said the greater goal—receiving a quality education with little to no cost—should always be at the forefront of a signee’s mind. Lamar said National Signing Day is just the start of a post-high school career that truly shapes the lives of young men throughout the country. He said Tucker High provides a great foundation for students moving on to the next level in terms of guidance and navigation. Stephenson and Tucker lead a districtwide tradition of success, followed closely by Cedar Grove, Arabia Mountain and Columbia high schools. As of Fall 2017, all of DCSD’s 19 football programs were represented on at least one college football roster. Click here to view pictures from National Signing Day.